If you ever see a pile of shoes outside of a door, conform. 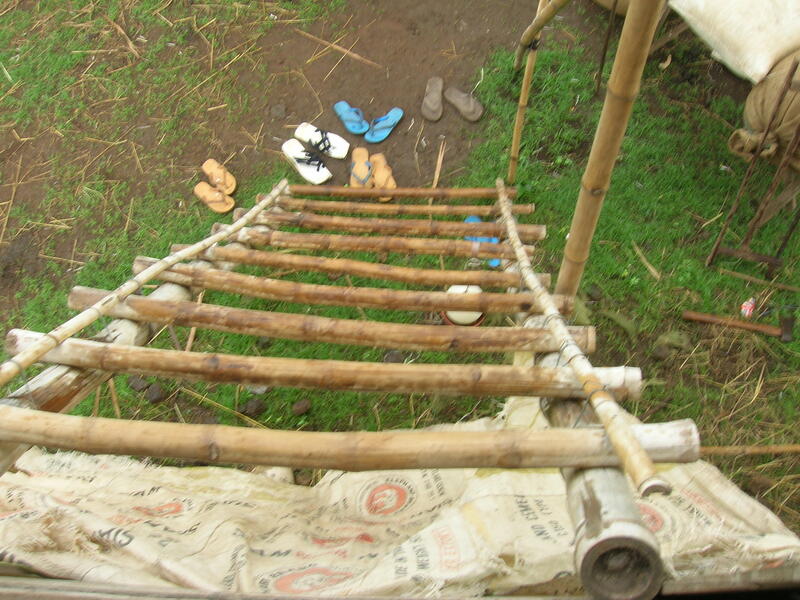 Take your shoes off and add them to the pile before entering. I took this photo from the doorway of a stilted home in Toul Sre. My brother will be happy to see this one… 🙂 I tried the crickets (chongrit). When the rains start coming, the cricket’s burrows fill with water and they come above ground to find new homes. At night, Cambodians, mostly children, go cricket hunting. 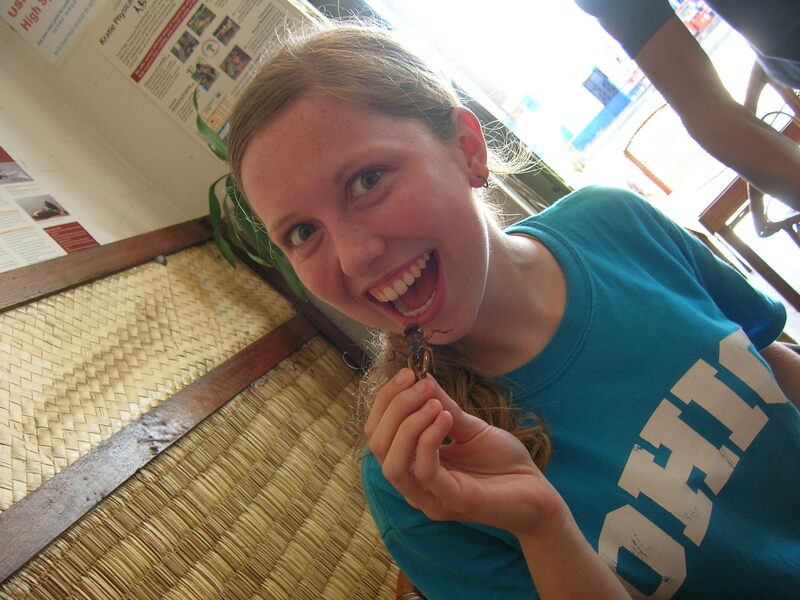 When they fill a bottle full of crickets, they fry them up with oil and salt (or sugar). This one was crunchy, and the spiky legs hurt my tongue a tad… but I found out that most Cambodians don’t eat the legs due to the spikes. I should have asked beforehand! 🙂 If you’re ever here during cricket season (haha), try one. Not half bad! A random Swiss tourist named Muriel took this photo. We ran into her all over this week! Allyn and I went for a ride on the Mekong river near Kratie (we bumped into Muriel here as well- she’s the blonde in the video). We saw some endangered Irrawaddy dolphins up close! The boat driver said he usually sees one or two at a time, but we saw eight, swimming in two groups. These freshwater dolphins used to inhabit the Mekong river from headwaters to delta, but now, the stretch near Kratie is where the only remaining Irrawaddy dolphins live. The dolphins are dying out in part because they have been over-hunted and the soldiers in this historically war-torn region used them as target practice. There are only 80 Irrawaddy dolphins left, so the World Wildlife Fund and other environmental organizations are trying to educate the farmers and communities around the Mekong to preserve this specie. 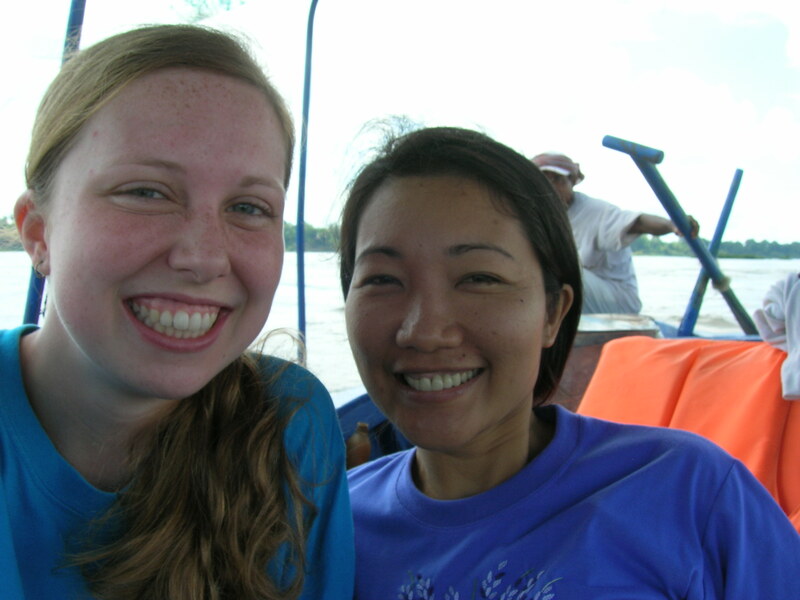 Allyn and me on the Mekong river. Getting around Phnom Penh is fairly easy once you get the hang of it. There are three modes of public transportation. A cyclo is a like a backward tricycle that pushes a little cart. It’s similar to a rickshaw, except it pushes instead of pulls. These are dying out since motorized transportation is significantly faster. A moto is a motorcycle, and this is my preferred method of transport because it is economical and convenient. Moto-dopes (moto drivers) often carry two or three people on their motos. I’ve seen motos loaded down with lumber, chickens, and a myriad of other things since I arrived. Tuktuks (as shown in the video above) are motorcycles pulling a little cart on the back. This vehicle was created in Thailand and is becoming increasingly popular on the streets of Phnom Penh. The downside is that a tuktuk is slower and more expensive than a moto. If you have a larger group of people or a lot to carry, however, a tuktuk might be a wise choice. For example, Allyn, Kim, and I used a tuktuk to pick up my bag from the airport and to get around town during our cultural orientation. Hiring transport goes like this: I walk down the street looking back and forth. A moto-dope waves his hand and yells at me. I tell him a landmark near my destination (a market, temple, or monument) and ask his price. He gives me an inflated price. I give him a surprised face and cut his price in half. We haggle back and forth until we arrive at a good price. I pull on my helmet, hop on (sidesaddle, since straddling an unknown man is inappropriate), and we’re off! My roommate, Kim, had a modeling gig at a local restaurant on Friday. Haha… The expatriate community holds crazy events like this one, a trash fashion show, at restaurants on the weekends. 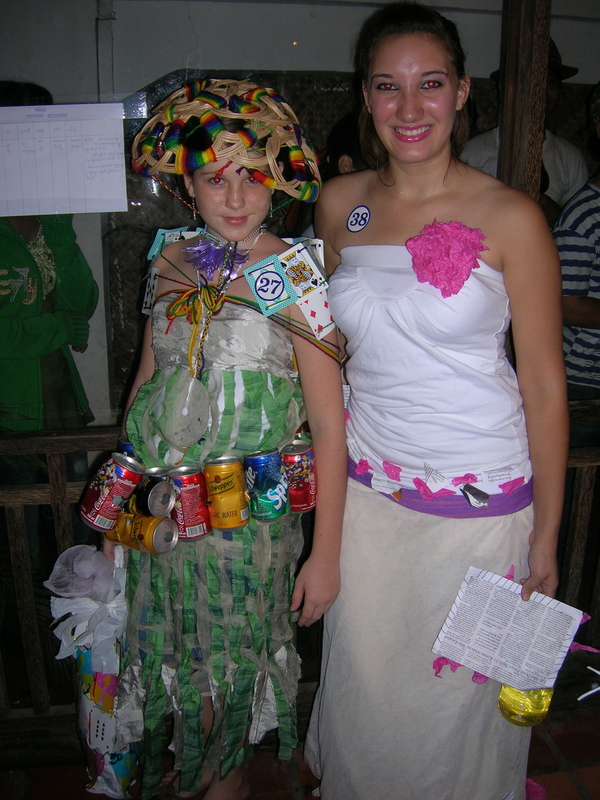 Participants designed their outfits using recycled materials (aka- trash). Kim’s outfit, designed by her supervisor’s daughter, consisted of mosquito netting, old newspaper, and tissue paper. There were some wild outfits, including a dress made entirely of milk cartons that won first prize. Here is the Cambodian money- Riel. All the bills are pictured (front and back)- 100, 500, 1,000, 5,000, and 10,000. I have not seen any coins yet. In Phnom Penh, US dollars are used as much as Riel, creating a nice cash flow that helps keep Cambodia’s economy stable. I use Riel for transportation and haggling in the market, but at grocery stores and most restaurants here in town, I use dollars. In the provinces outside of Phnom Penh, however, I use Riel primarily. The bills picture scenes from Cambodian life and famous monuments like the Independence Monument and Angkor Wat. 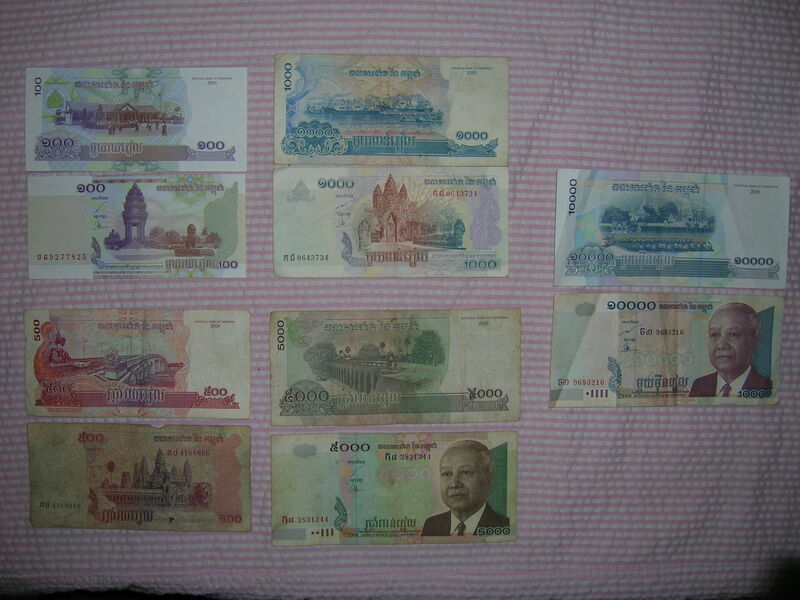 The 5,000 and 10,000 bills picture the King Father, Norodom Sihanouk. He abdicated his throne several years ago because of his poor health, and his son, Norodom Sihamony is now the King. At a wedding on Saturday, I witnessed lots of pomp and ceremony that was unfamiliar to me. Here, the bride, groom, and wedding party are circling the table with the wedding cake before cutting it. I’m not sure of its significance, but they circled the table two or three times before actually cutting the cake. The bride and groom do feed each other cake, but first, demonstrating their deep cultural respect and deference to elders, they feed their parents. Here I am with Bo, Thida, one of the Aunts, and Rosa at the wedding on Saturday afternoon. I came to the wedding in a dress shirt and Cambodian skirt without any makeup (as is my custom… haha), but my host (Bo) insisted that I needed to look more Cambodian. She gave me one of her dresses to wear and took me to a beauty parlor where she instructed them to do my hair and makeup in the Cambodian style. Obviously they did. 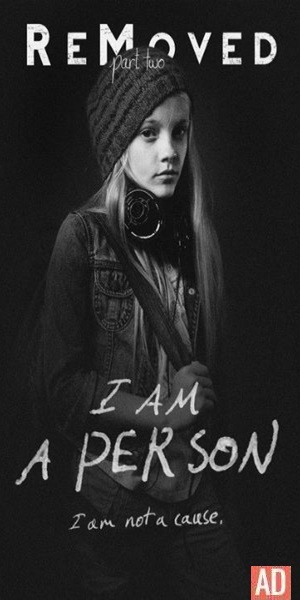 Haha… I felt slightly ridiculous, which was partly due to my aversion to beauty parlors and partly due to the foundation that clearly did not match my skin tone… haha… After the transformation, everyone insisted I was so sa’at (beautiful). I just went with it… knowing fully that even with my Cambodian makeover this 5’8″ white giant would still stick out like a sore thumb in the throng of wedding revelers. The wedding and makeover was the most stretching experience of my time here so far! Posted by Jennie Joy on May 20, 2007 in Photos, Relationship, Video.